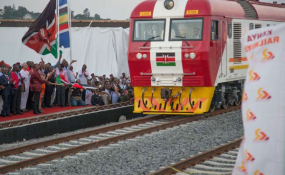 Importers who ordered goods ahead of December 31 have been spared the 79 per cent rise in cargo charges on the standard gauge railway (SGR) from Mombasa to Nairobi. The importers have been given until end of March to ferry their goods on the discounted SGR cargo rates amid a petition from the Kenya Association of Manufacturers (KAM) to delay the new rates, saying the higher charges will increase the cost of doing business. The cost of transporting a 20-foot container from Mombasa to Nairobi increased Tuesday to $500 (Sh51,275) from Sh35,000, a 46.5 per cent rise. Hauling the larger 40-foot container will cost up to Sh$700 (Sh71,785), from the current Sh40,000, reflecting a 79.9 per cent rise. "Those who ordered for [sic] goods before December 31 will enjoy the promotional rate until March 31," said a source at Kenya Railways who sought anonymity. "We will use the bill of landing to identify those who qualify to enjoy the lower rates." The bill of landing is a shipment receipt that shows the type, quantity and destination of the goods carried as well as date of shipment. The SGR cargo sector has struggled for business in the face of competition from truckers, prompting a sustained government campaign to drive cargo to the rails in the push to make sense of the SGR investment. Kenya requires additional cash from the railway business to ease the taxpayers' burden of paying the Chinese firm managing the SGR. China Communications Construction Company runs the SGR cargo and passenger business at an undisclosed management fee. The Treasury also expects the SGR business to generate more revenue to help offset loans borrowed to build the multi-billion shilling railway line, which become due in July after the end of the five-year grace period. Kenya will pay Chinese lenders Sh82.85 billion in the year starting July, up from Sh36.2 billion in the current year. The loan will be repaid in 15 years. Those transporting cargo from Nairobi to Mombasa will pay $250 (Sh25,637) for a 20-foot container, up from Sh25,000, while a 40-foot container weighing up to 20 tonnes will cost $350 (Sh35,892) and $375 (38,456) for those weighing between 21-30 tonnes. Kenya Railways has been charging Sh30,000 to transport a 40-foot container from Nairobi to Mombasa irrespective of weight.